with or without Slide Fastener Closing. The copyright date on the envelope is 1938, the pattern could be a year or two later. Suggested fabrics include novelty cottons, suede cloth, velveteen (! ), corduroy, woolens, flannel, linen. Written in pencil on the front of the envelope, "Mrs White Pd" I have a fair number of patterns with names penciled on the front. Wouldn't it be wonderful to have a snapshot of Mr. White wearing his snappy bush jacket? oh my! you know what? i think my grandmother might have had this very pattern!! my father has a woolen shirt that his mother made for him when he was a teen- it looks as though she may have used this very pattern. he was born in 1930 so the timing is right... how cool! 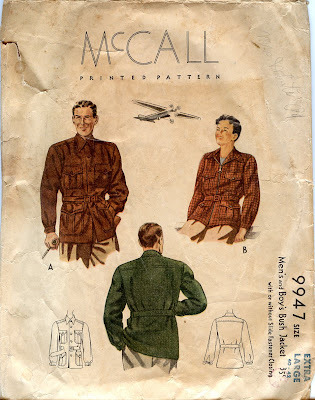 I'd love to know when the earliest home sewing patterns appeared for "bush" jackets, and what motivated the style. I certainly recall patterns for them in the 1970s.